18" Slim Tub, Top Control Dishwasher, 5 Cycles, 48 dBA, Stainless Steel, Flexible Rack Loading, ENERGY STAR Certified, Meets Consortium for Energy Efficiency (CEE) Standards IN HARMONY WITH NATURE Blomberg believes your home should be as smart as you are, in every sense of the word. That includes performing flawlessly while protecting the planet. It’s a philosophy that earned us the ENERGY STAR® 2018 Partner of the Year Award. 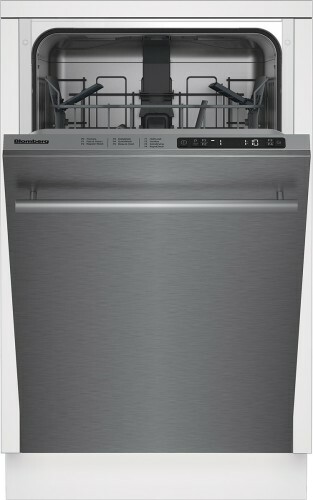 All Blomberg dishwashers are ENERGY STAR certified for using advanced technology to clean your dishes brilliantly with less water and energy. Unique design features include multiple insulation layers to reduce thermal loss and a variable speed circulation motor that automatically adjusts for optimum water and energy consumption.FLEXIBLE UPPER RACK When the need arises, the hard-working upper rack can be raised to make room for pans, platters, and trays in the bottom rack or lowered to accommodate tall glasses up top. FlexiRack allows you to adjust the height in one simple action, even when the rack is fully loaded.